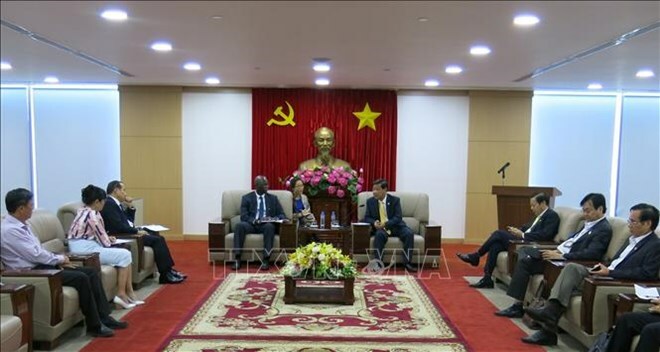 Binh Duong (VNA) – Country Director of the World Bank (WB) in Vietnam Ousmane Dione held a working session with authorities of the southern province of Binh Duong on March 26 to discuss cooperation in infrastructure development. Dione spoke highly of Binh Duong’s economic achievements over the past few years, with economic growth at 14 percent and nearly 2.3 billion USD in state budget revenue in 2018. The province has increased investment in social and technical infrastructure while adopting effective steps in high-quality education projects, contributing to attracting quality investment in the near future. He lauded the province’s role in the WB-funded Di An wastewater treatment plant which, he said, was on schedule and effectively addressed environment pollution. The WB pledges to fund other wastewater treatment projects in Binh Duong and wants to turn the bilateral infrastructure and human resources training partnership into a model for others, he said. Chairman of the provincial People’s Committee Tran Thanh Liem thanked the WB for assisting Binh Duong in a number of projects, especially those regarding the environment, thus effectively helping to reduce pollution in the locality.